As a renter obviously drilling holes in the wall is out of the question, even stick on hooks and blu-tak are out of bounds for me. Luckily I had 3 hooks that were already in the wall, before we moved in. So I had to make the most of them/utilize them straight away! This may seem a bit silly but it works for me, anything to add colour to the less than desirable cream and beige walls. It’s basically just a piece of IKEA home dec fabric. I sewed another fabric to the back of it (right side against right side), left an opening at the bottom, turned it the right way and sewed up the bottom. I did this to close off the edges. It doesn’t really bother me that you can see the repeat in the pattern. It is attached to the hooks with some bulldog clips. Nice, simple and easy! I don’t even want to show you this next one completely in context next to the window, because the blinds are a revolting green/grey colour. 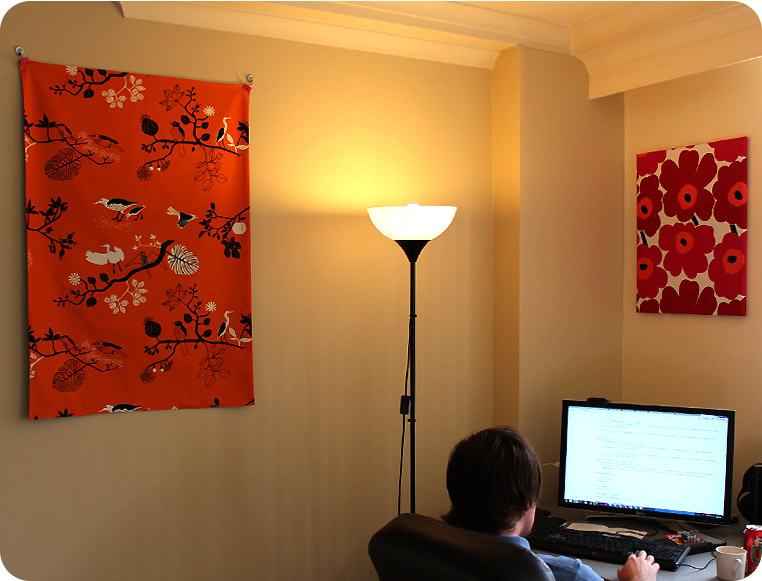 Anyway here is my awesome fabric covered canvas. 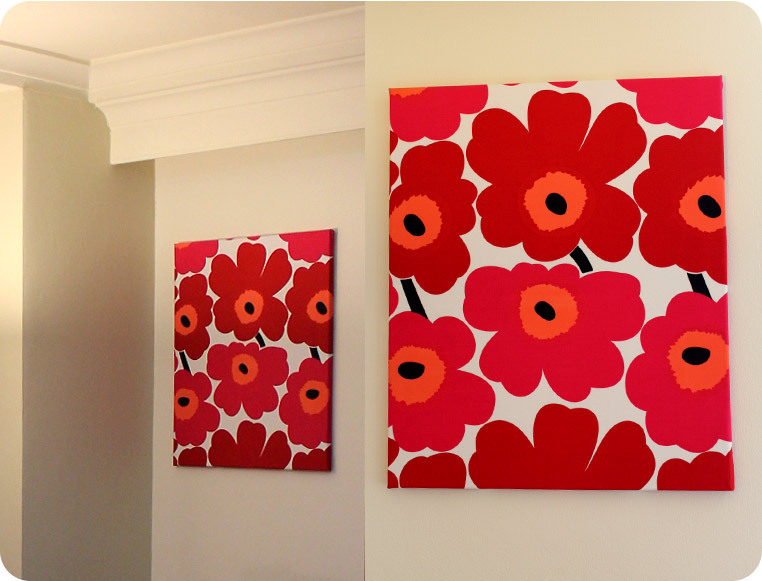 The print reminds me of the iconic 60’s marimekko flower print (my favorite!). I also made a sun dress out of this fabric a while back :)! Covering a canvas is pretty easy. I just bought an art canvas and used a staple gun to attach the fabric to the back. A good tip I discovered when doing some of these fabric covered canvases is to use double sided sticky tape between the canvas and fabric when deciding on the positioning (before you staple it on). That way you can re-position if necessary or ensure that it temporarily holds in place before using the staple gun. 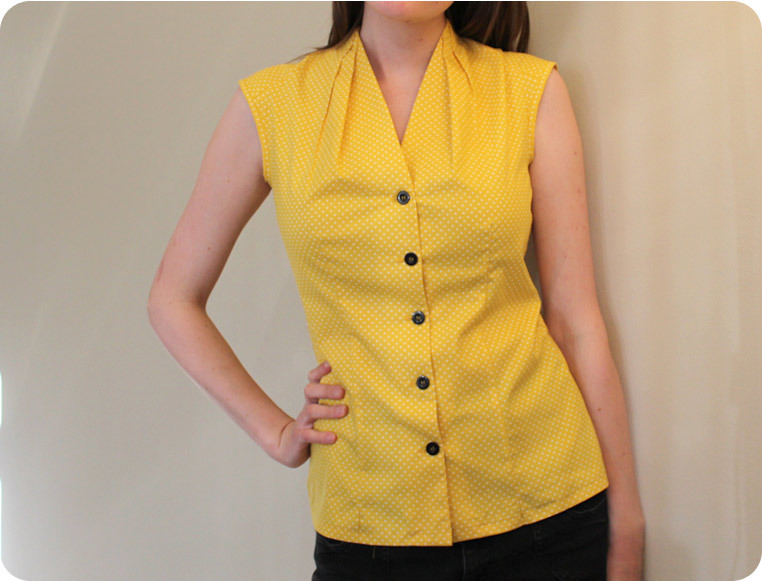 Loving the dressy retro look of the finished top. 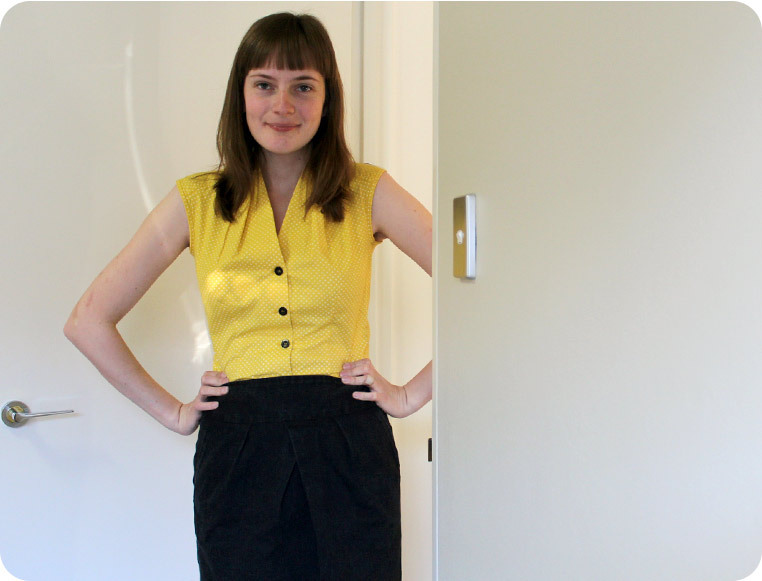 I also made the skirt, it was a pattern from a Burda Style magazine as well, but I made the skirt so long ago, I can’t remember which issue the pattern was from. I like this top best when its tucked into a fitted skirt. Sorry not really sure why I am doing that weird thing with my hand haha. I will definitely be making another version of this top. It’s cute and it’s quite practical to wear on occasions that require a more formal/dressy look. Here is the top sans skirt so you can see the altered fit. It’s still a relaxed fit, just a little bit more defined at the waist. I added darts and took the side seams in quite a lot. I didn’t bother putting darts in the back. 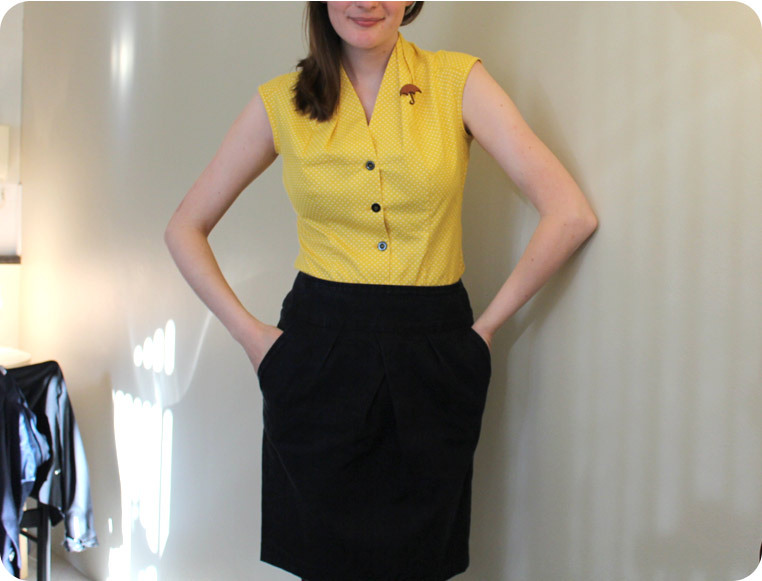 The button spacing is not quite right but I’m not too fussed about it because I will only be wearing it tucked in. Pleated blouse progress and upcoming projects. 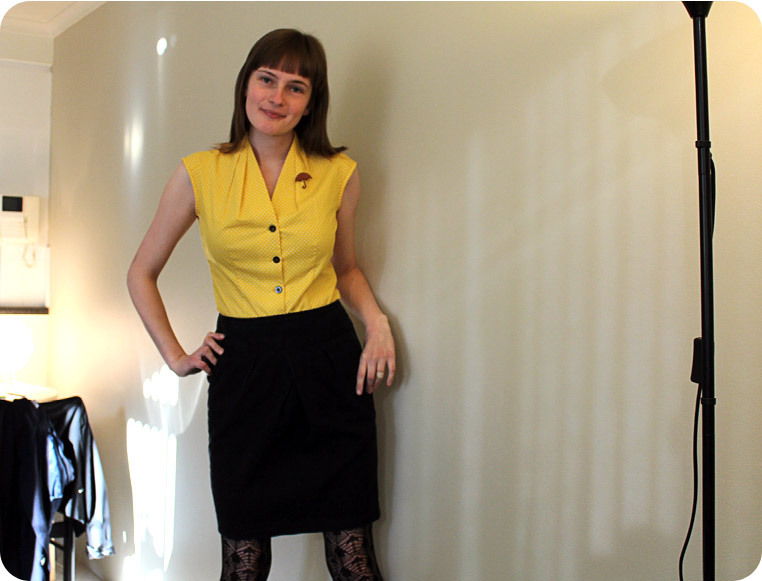 So the yellow Burda pleated blouse (from the last post) is now complete. The reason why it’s so horrid looking was because I was fitting (and re-fitting) on the already assembled shirt (so I was not working with a flat piece) therefore it was hard to record the positioning of the dart accurately. Sewing the next version of this shirt should be interesting haha! 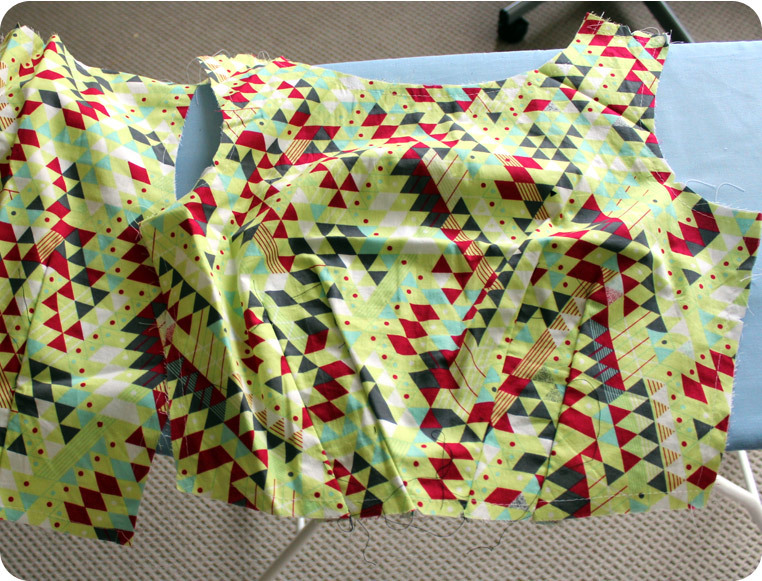 The next picture is of one the amended side seams on the pattern piece. When I take the side seams in, it’s common for me to keep the piece I cut off/removed and then sticky-tape it back onto the pattern (away from the seam). That way if I need to retrace my steps I know how much I have removed. Does anyone else do this? In this case I took the side seams in a bit and realized I needed to take the seam in a second time, so thats why there are two pieces stuck to the inside of the pattern. Ah fitting and pattern modifications what a boring, yet necessary evil. Onto something more fun…The next project. 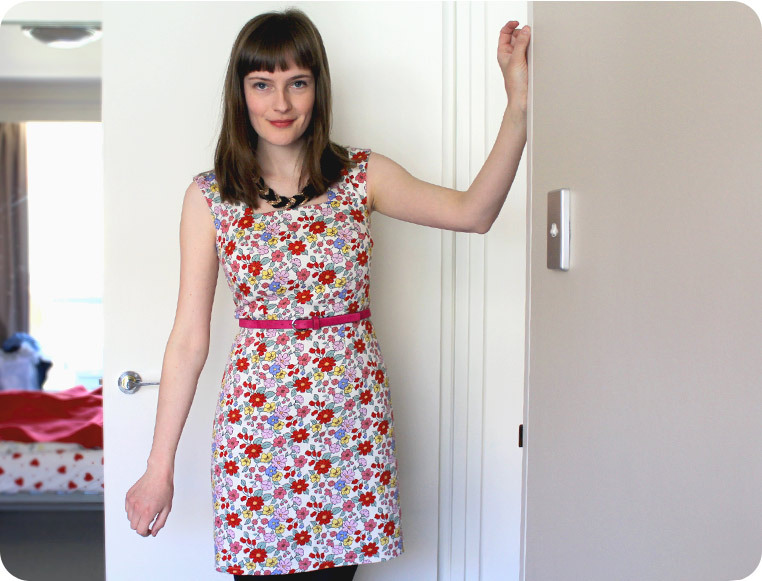 I am making a dress using simplicity 2444 again. I altered the pattern slightly and removed excess from the top of the neckline so that it would not gape so much, so I wanted to test the modified pattern using a fabric that wasn’t new or super fancy. 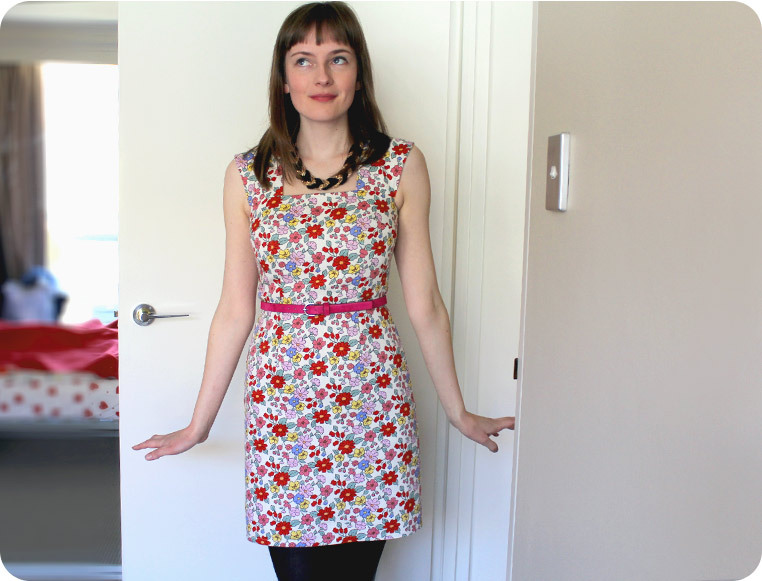 The fabric began it’s life as a spaghetti-strap sun dress. Thin straps are unflattering on me but I knew I had to salvage the fabric because I loved the print so much. There is only enough of the fabric for these bodice pieces (the sleeves and the skirt will be a soild black). 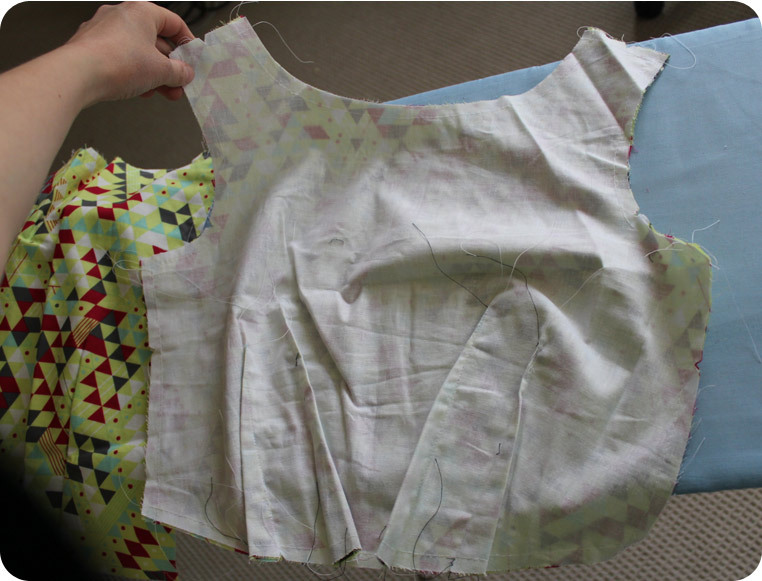 The fabric was also very see-through so I had to underline the bodice pieces (I used a bleached calico). To underline the pieces I machine-basted around the seam allowances of fabric and underling pieces, basing the underling and the fashion fabric together. I also machine basted the dart markings (the basting had to be unpicked once the darts were sewn together). 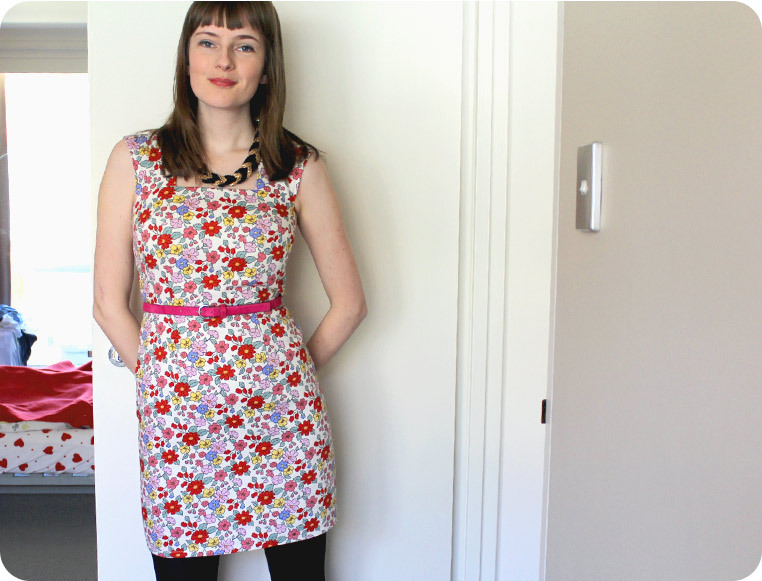 Underling is time-consuming, but it gives the fabric a lovely weight and really enhances it. Love it! 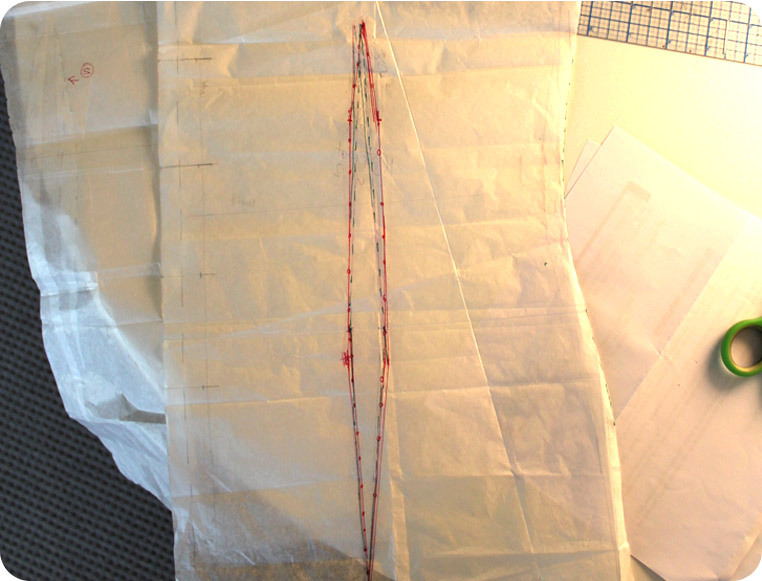 If you underline by hand sewing, give machine basting a try! It is so much quicker. I just length my stitches and make sure the tension is loose. I am also going to line the bodice in black (yes I am slightly crazy, but you know I hate facings in dresses). 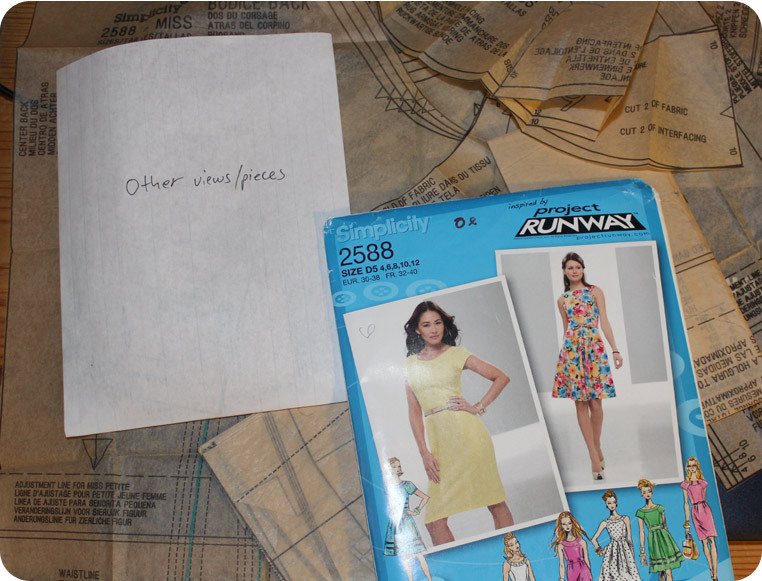 A lot of these project runway patterns have a lot of different styles/pieces in the one envelope. 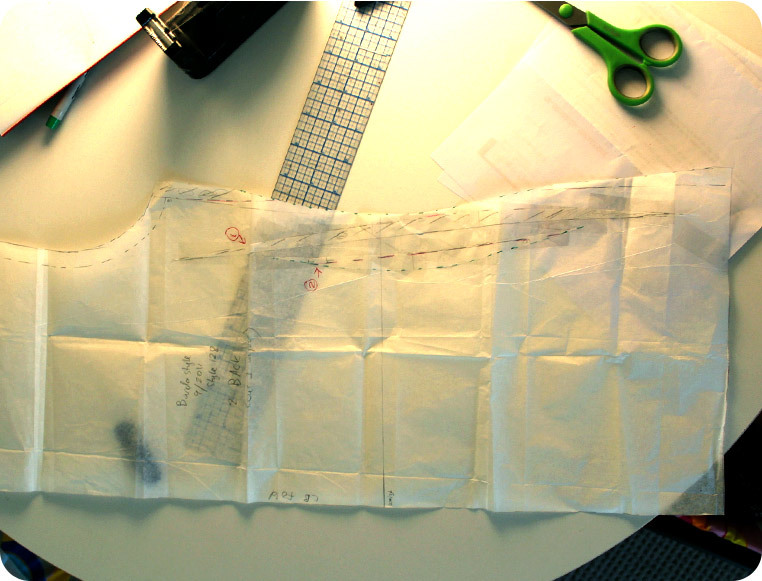 I often create a smaller envelope to hold the other pattern pieces I’m not using. This envelope is just made from thin note paper and can can then go inside the main envelope. That way I can isolate the pieces I’m working with and avoid confusion. I feel like this post may have been a little boring, but sometimes it’s good to share the process. Next up is my finished top! :). 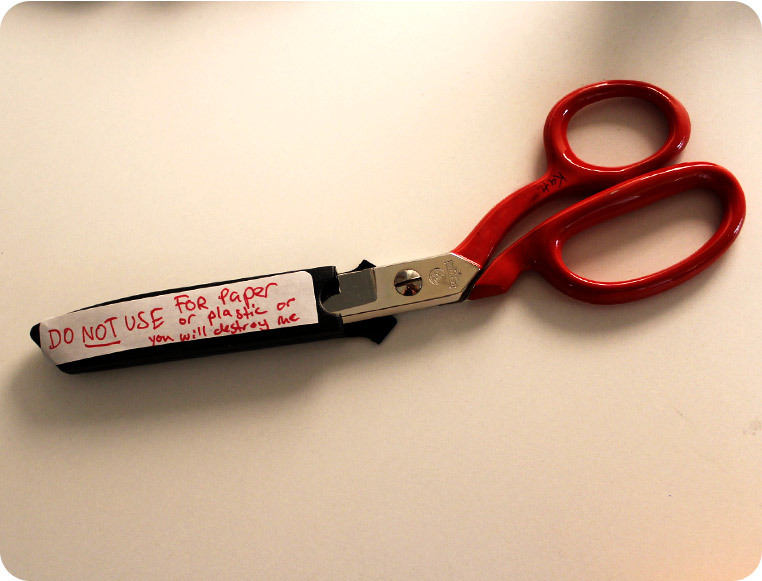 I live with my boyfriend now and he knows not to use the good sewing scissors, but I thought some fellow sewers may get a kick out of my scissor warning. Do not use for paper or you will destroy me. LOL! I have almost finished this top. 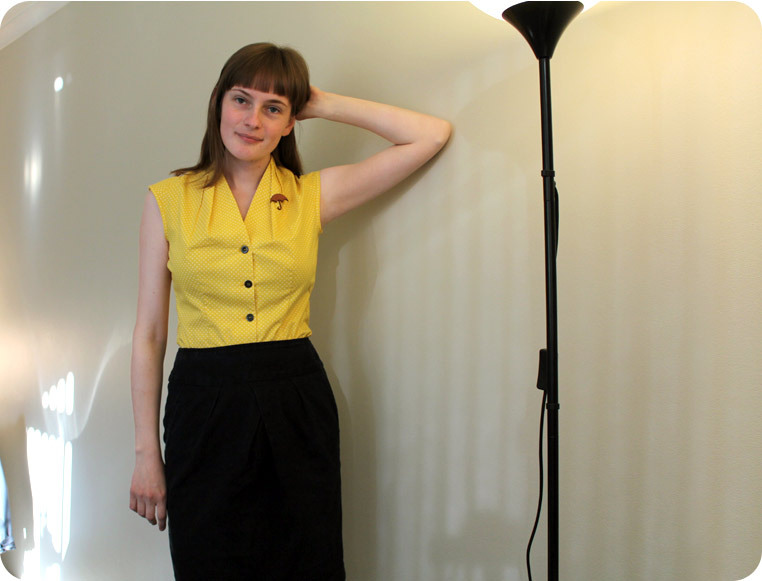 I have been enamored with this pleated top for a while, it seemed dressy and versatile with vintage flair. I was worried It wouldn’t suit me, but after sewing the buttons and trying it on I love the affect of the pleats around the neck! There is only one thing that needs some tweaking and that is the fit. I do prefer more definition at the waist. It really needs more shaping. Because I made it in a medium weight poplin when I belt it or tuck it into a skirt it creases like crazy! So if you are making this pattern and prefer a more fitted silhouette bear in mind it does have a lot of ease at the sides. I am going to take some width out of the side seams and add darts to the front. There go the fancy side seams I made. I must remember to fit as I go. I should have pinned where the buttons were to get a better idea of the fit before finishing the side seams of. Ah sewing, you never stop learning from your mistakes :). Good news! I have rejoined the 21st century :). We now have internet in our apartment (was using Internet on galaxy tab and from my parents house prior to this). I can’t even explain how excited that makes me! I feel silly for posting a picture of something I already posted/made a long time ago, but the original photos were not good and I wanted to celebrate being able to wear this dress again. The weather is FINALLY getting a little warmer, a very welcome change! It’s warm enough to wear it today without a cardigan. Miracle! I originally posted about making this dress here. The last time I wore this dress was Christmas of last year. 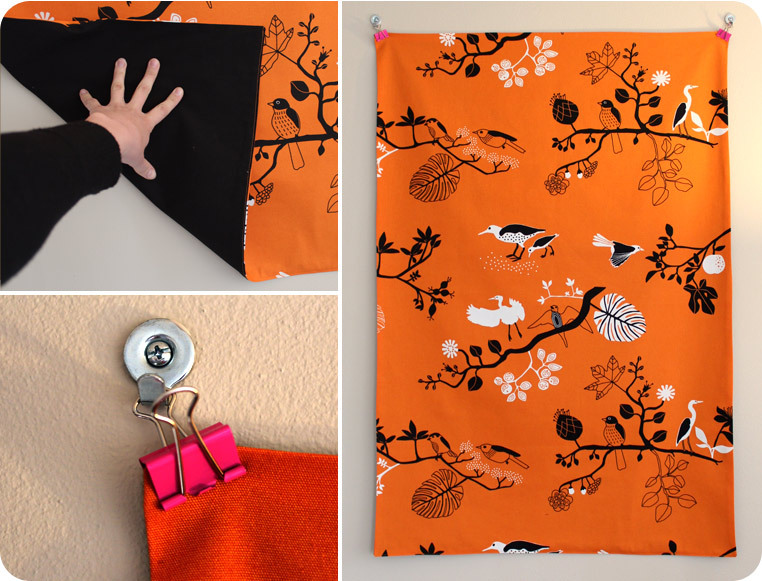 For some reason I just love the print of this fabric! So after I get some work done I am going to get some D.I.Y and sewing youtube videos playing while I cut out my next project. I can’t wait! Just before I post I will say that I am still moving in so things don’t look so crash hot. But you have to start somewhere right? 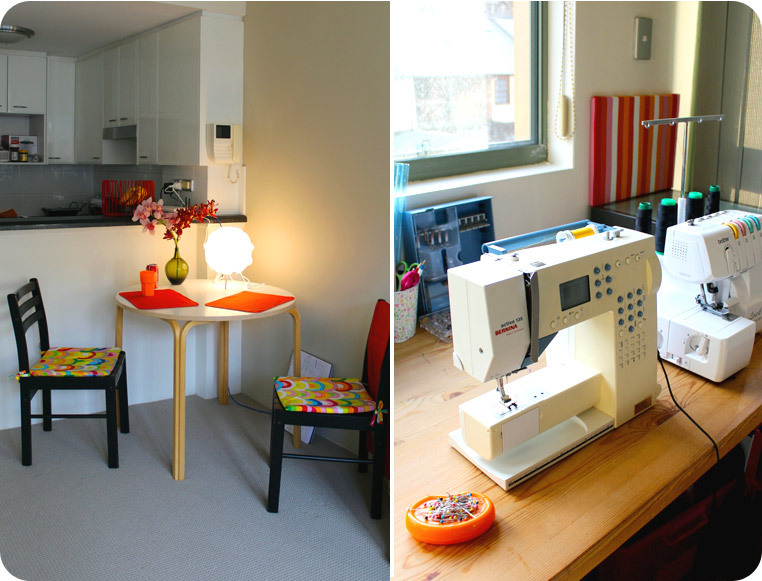 I am just sort of celebrating the fact that I have my sewing machine in my apartment now :). I feel so lucky to be living in the city with the person I love (this has been my dream for so long!) and I am really happy to be living in such a nice quiet place. 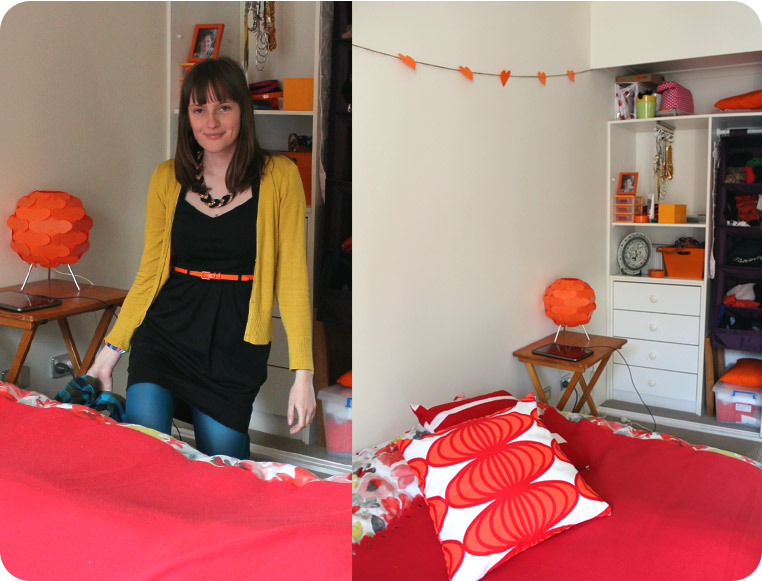 I am trying to think of ways to add colour and make our little place look more cheerful. I love bright colours and simple modern furniture but that seems incongruent with the beige-green that the walls are painted (I would have been so much happier with white!) I must confess I REALLY really dislike the grey-green blinds (plus unattractive pinky-brown curtains in the bedroom). But as a renter you have to accept these things. My boyfriend doesn’t even want to risk putting blu-tak on the walls, let alone removable hooks because, we are scared of it marking. It does make decorating challenging. A rug should help a little! On the left is our little dining table. I love the round table but I really dislike that these chairs are black (must learn how to paint them white) but they were free. Who is going to say no to a free chair? Not someone in my situation. I made the chair cushion covers and I am not afraid to admit that they look a little ridiculous on the black chairs, if they were white I think the crazy print would work on them. I also made the orange place mats, I made a whole stack. In other news my machine is fixed and in the apartment. They also replaced the bobbin case door can you tell? haha. We don’t have room in the apartment for all my fabric, but I took a small selection so I have something to work with. My second problem was that my boyfriend said that when we have all the furniture in the apartment we wont have room for any shelves and having one would create too much clutter. 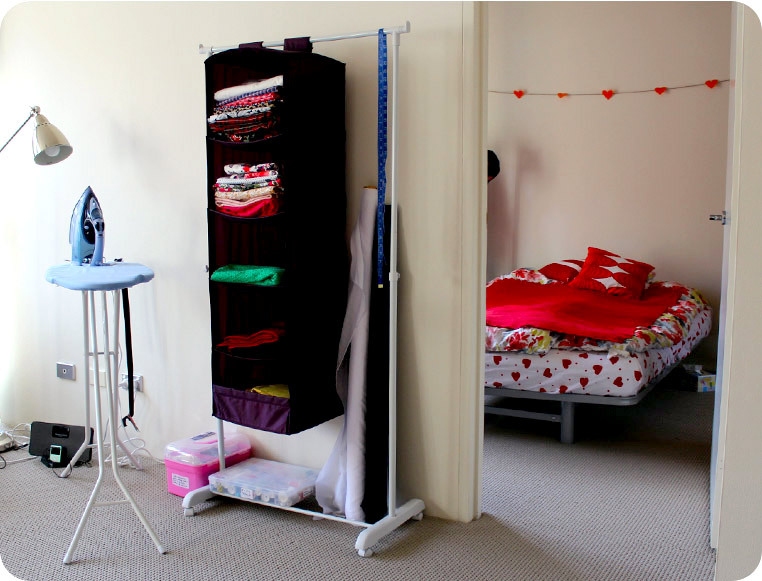 My solution was to create a temporary shelf out of a clothing rack and a velcro-on storage shelf from ikea. Then I can take it apart it and move it when we move in the TV and more furniture. I just love looking at my fabrics. Yes I get joy out of just looking at them…I’m a crazy one! 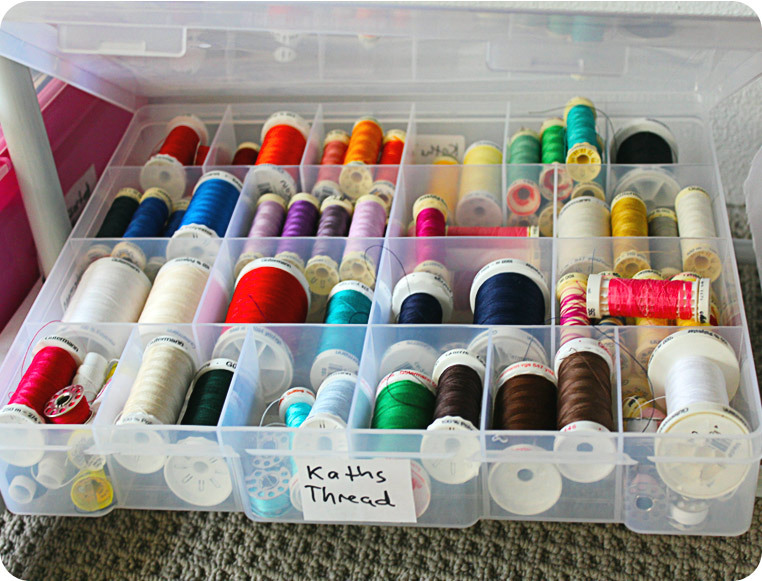 Let’s talk storing all the beautiful Guetermann thread. I really like those wooden spool racks people have on there desk or hanging on the wall They look a lot prettier. But I like the above option because: 1. I Can’t hag stuff on the wall and have limited desk space 2. I need to transport my thread. So I bought this plastic tool box (or tackel box? perhaps) at the hardware shop for about $12. That way its easy to stow away and doesn’t get dusty. My bobbins go into bobbin cases but some of them end up here too. Oops! Look here I am weirdly crouching by my bed. I had to show you that my belt matched the lamp…or something…LOL. Like I said… I can’t put anything on the walls 😦 but I thought that putting a one tiny blob of blu-tak in the wardrobe in order to put up some homemade paper heart bunting would be pretty harmless. 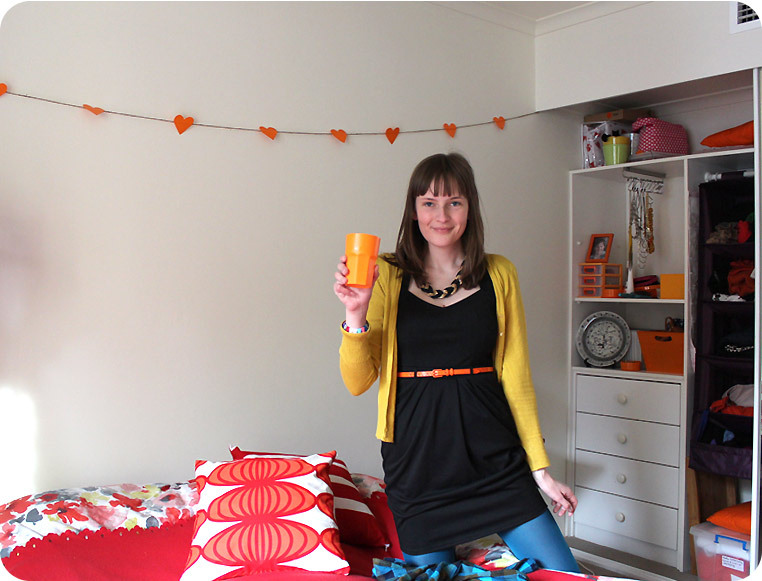 Lets look on my cluttered wardrobe shelf shall we…Can you tell I LOVE orange? If I had my way everything would be orange mwhaha ha. 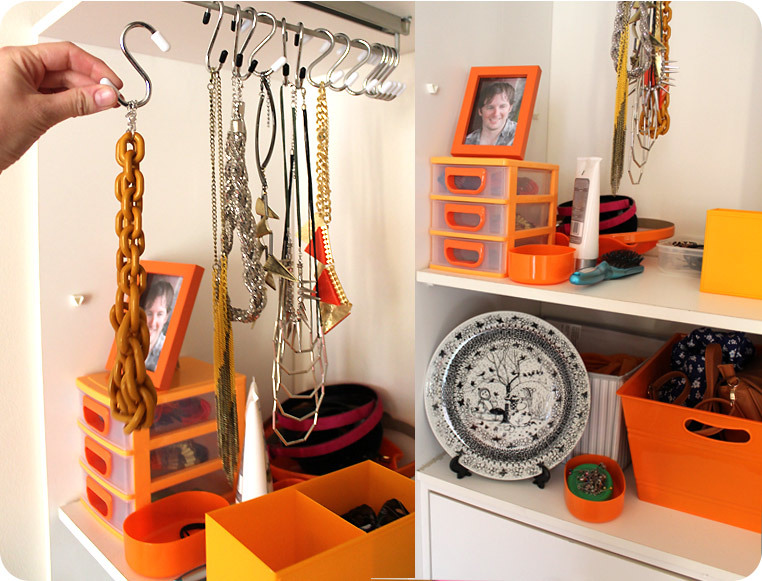 Anyway as you can see I have a selection of my beloved necklaces on these removable hooks for easy access. The metal removable hooks are super cheap to buy (hot dollar) and it’s handy to be able to take my necklaces down easily when creating outfits! I don’t know what the bar was originally meant for but it’s great for holding the necklaces. My boyfriend is so lovely he actually let me have the entire wardrobe. His clothes are near his bed on a rack. isn’t he super sweet?! Anyway there is my humble little place I am SO happy to be living here. 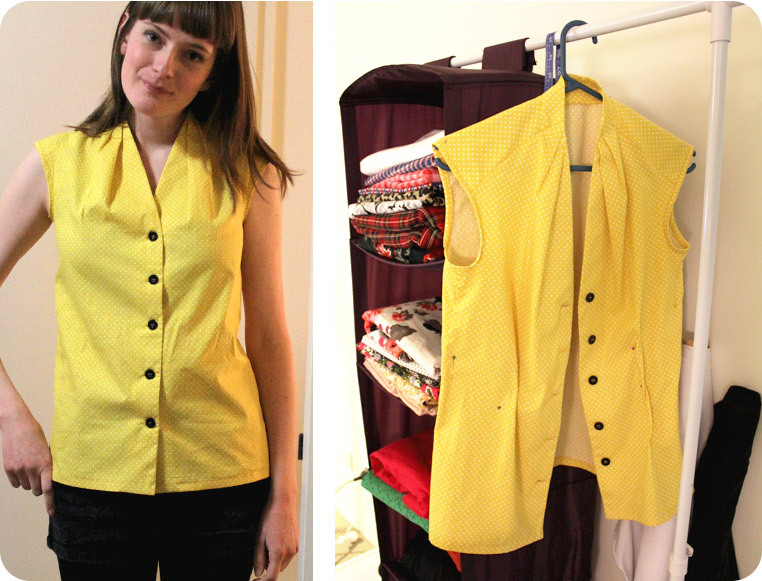 I am almost finished a top from a burdastyle magazine so I can’t wait to post it! In order to write this post I am tethering to my boyfriends tab (because he has data on it). We still don’t have Internet, I’m hoping that we can get it sorted tomorrow. I have so many sewing blogs to catch up on! Here I am kneeling my way into the picture again. LOL. Cheers! My machine stopped working properly. I know these things happen, but I must confess I am pretty devastated.